We had discussed in an earlier article the theoretical options available to weak nations, listing among them: an alliance with one Strong nation, with multiple Strong nations or with a large group of non-aligned nations. We had then discussed the pros and cons of each option. It seems that Kuwait had begun moving in that direction as early as 2004, when it joined the NATO Initiative, and has now taken a further step in agreeing to set up a permanent NATO communication and coordination center. In principle, this undoubtedly is a wise policy move that will contribute to deterring the obvious short term threats. But will it be sufficient? Or, will it take more steps to buttress its security by adding more options? We had mentioned that the best solution for a Weak party is to ally itself with multiple Strong parties. This would provide greater protection, as well as render the weak party neutral in the event that its two strong allies have a falling out with each other. We posited that the success of an alliance with multiple Strong allies, even if they are at odds with each other, may be enhanced if other Weak parties are included in the alliance, so that no single Weak member is isolated and subjected to pressure or criticism by its Strong allies. Accordingly, we had recommended the Non-Aligned Movement as a good route to achieve that end – Or any other grouping of nations, new or existing, that can deliver the same advantages. In all cases, having multiple allies is wise political hedging, and may be a lot cheaper in the longer term. This contrasts with having one single Strong ally, who keeps the Weaker ally on its toes, unable to predict when it may be asked to pay-up for the protection services, and unable to estimate the size of that bill in monetary or moral terms. And because, the world is in constant motion and change, the Weak party’s greatest fear is to wake up, one unfortunate morning, to a nasty surprise. One of the relevant changes that has occurred in the past few years is the much-discussed US “Pivot to Asia” strategy, which presupposed the reduction of US interest in the Middle East. This had spooked and then angered many, and contributed substantially to the upheaval and turmoil that has befallen all the countries in the region. The specter of US departure, or the mere changing of its priorities, has reshuffled the chess pieces on the board, and thrown all the players into total confusion. More recently, a major change has occurred with the election of Donald Trump to the Presidency of the US. He is on record, repeatedly stating that the free protection of the Middle East is no longer acceptable, that he desires to shrink the number of the thousands of US military bases strewn all over the world, rebuild the American economy and reduce spending on foreign military adventures in the elusive quest for world hegemony. He also, repeatedly denigrated NATO and indicated that the US will no longer be Europe’s or NATO’s Sugar Daddy, thus angering as well as frightening the Europeans. In short, the US seems to be flirting with the famous nineteenth century Monroe Doctrine, that isolated it from the Europe and its troubles, and enabled it to concentrate on the Americas: north, south and central. 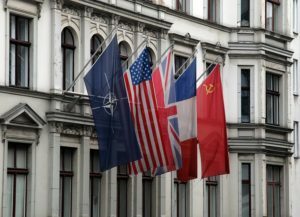 The analysts and political pundits are almost unanimous that NATO without the US, would not be the all-powerful giant that can scare and deter enemies, be they real or imaginary. Hence, it may be wise and justified for us to add more allies to enhance our security, if we want to sleep soundly at night. The UK has already indicated its willingness to return militarily to the Gulf and provide the much-needed security. This is an attractive idea, especially as our long relationship with Britain has been generally peaceful, fair and mutually beneficial. Also, any new negotiations are likely to be among equals rather than the case one hundred years ago. However, we should not forget, or ignore, the other Strong parties; namely Russia and China. Without them, the formula is incomplete, especially as the world balance of power is still cooking in a large pot, and the nature of the final dish is still unclear. An alliance with those two powers does not necessarily mean a military one, which may upset our other allies, but rather an economic and commercial one. There is the OBOR (the new great Chinese Silk Road) that is bound to dramatically change the world trade patterns. It still has plenty of opportunities available for us to participate in, either through direct investments or by becoming one of its nodes or end stations. As for Russia, it is today similar to what the US was in the nineteenth century; blessed with great natural and human resources offering fantastic investment opportunities. Russia would be ideal for investing part of our reserves to create new income streams to supplement our dwindling oil revenues – as well as protect our assets from unjust and temperamental confiscation by the US JASTA law.